Family fun at Upslope’s FREE music festival, Learn about the Chemistry of Energy, Learn about migratory birds at Walk in the Wild, Celebrate plants and insects alike at the Butterfly Pavilion’s Bloomapalooza, Watch hot air balloons launch and enjoy a town fair at Erie’s Town Fair and Balloon Festival, and Practice yoga with dairy goats at the Vali Soul Sanctuary! All happening this weekend in and around Boulder. Upslope is hosting the 4th annual Upslope Get Down, a FREE music fest with Upslope beer, food trucks, a kids zone, art, vendors and more on Saturday, May 20th from 1:00-10:00 pm at Upslope’s Flatiron Park brewery. The Kids Zone will run from 2PM – 6PM, featuring a rock wall, face painting, games and more! The day will be filled with music on three different stages (see music schedule below). Upslope is partnering with Protect Our Winters as this year’s event beneficiary with a portion of profits being donated to their cause. Protect Our Winters is a passionate crew of diehards, professional athletes and industry brands mobilizing the outdoor sports community to lead the charge towards positive climate action. They focus on educational initiatives, political advocacy and community-based activism. Join CU Wizards Professor Steve George for another lively Saturday morning of educational fun! The Chemistry of Energy will tell you more about where all your energy comes from and where it goes! Be sure to eat a good breakfast…because rumor has it that Professor Goerge’s Cookie Oven will be at the show filled with…well, what else? ENERGY! CU Wizards lectures are free STEM shows appropriate for elementary and middle school students who love learning about science and nature. Students, families and teachers are encouraged to attend. Kids will love the 8th annual Walk in the Wild event in Boulder, a great way to learn more about birds and have fun in the great outdoors. Celebrate International Migratory Bird Day by visiting the event’s education stations, go on a guided bird walk, and meet raptors in the hand. Feeling crafty? Paint a bird for our Flock project. Free food and much more. This event is free, but also serves as a fundraiser for habitat restoration. All of the proceeds from this event are returned to Boulder County to purchase native flowers, shrubs, and trees that will be planted in Boulder County open spaces. Join the Butterfly Pavilion for Bloomapalooza, a nature-filled extravaganza celebrating the wonder of flowers and the pollinators who make their growth possible. Learn how to turn your backyard into a haven for bees, butterflies, and hummingbirds with hands-on gardening activities led by experts, and take home your very own seeds and plants from our Plant Sale, equipped with planting instructions and garden design guides. Witness a ladybug release, and explore plant diversity through a guided Garden Safari, a tropical scavenger hunt, a Plant Petting Zoo, and more. 21st Annual Erie Town Fair and Balloon Festival hosts over 200 craft and food vendors; performances on stage at Coal Creek Ball Park offer a variety of entertainment by local groups, carnival games and hot air balloons. 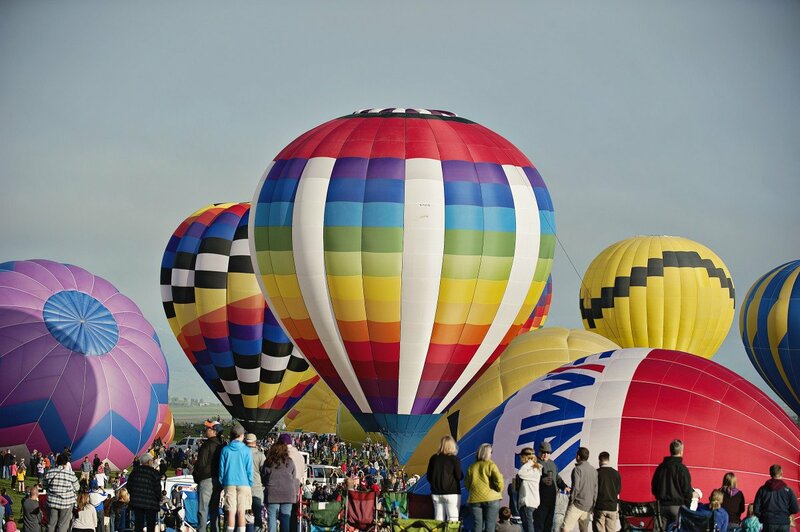 Hot air balloons launch at 6:15 am on Friday, Saturday and Sunday at Colorado National Golf Club, 2700 Vista Parkway, Erie. Saturday, May 20, the Town Fair will host vendors from 10:00 am – 4:00pm at Coal Creek Park. Garage Rats Car Club will be hosting the Car Show. Activities continue in the park from 4:00pm-9:00pm. 6 pm – 9 pm, Live Band-Chris Daniels & The Kings and don’t miss the fabulous Balloon Glow at 9:15pm, as well as fireworks to conclude the day’s festivities. Cost: Kids $15, Adults $25: Purchase tickets here. Vanessa Vitali and Mountain Flower Goat Dairy, are combining yoga with friendly dairy goats at the Vali Soul Sanctuary. Your children will love the baby goats who are full of curiosity, love attention and love to watch humans practice yoga poses. They’re cute, furry and are ready to frolic.